With the new football season in full swing, let’s think back to Euro ’16. This year’s competition clearly showed that it is possible to achieve more when we work together as a team. Think Wales, Northern Ireland and Iceland, playing beyond what was expected of them because of their ability to work together. This is something we can all learn from. Customer insight tells us that customers struggle to get an overall view of the first registration process and what they need to do to register a vehicle, step by step, to reach the end goal. They will call various agencies involved a number of times during the process to get information and reassurance that they are on the right track, and not heading for a yellow card. The frustration levels are high enough on occasions to challenge Ronaldo’s infamous tantrum in the Portugal v Hungary game. We need to work together to make the process easier for the customer. In this spirit of joined-up working to achieve more for the customer, we recently held a cross-government workshop to review the process. 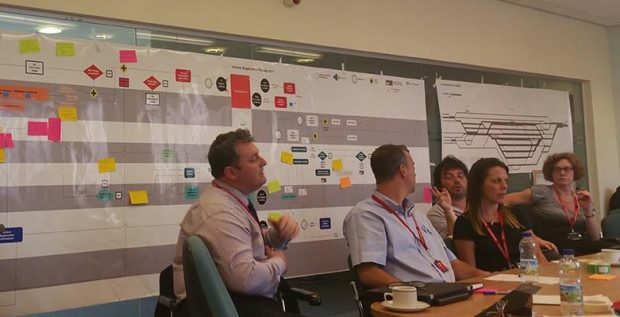 As the DVLA product owner for the service, I was keen to work with colleagues from other departments to review the end-to-end customer journey I also wanted us to talk about the issues encountered and look at ways to improve a complicated process which involves contact with various agencies. As a customer, if you want to register and license a vehicle for the first time you need type approval for it, which means contacting either DVSA or VCA. If the vehicle is imported, any VAT due is payable to HMRC, then DVLA needs all the information from the other agencies to register and license the vehicle. It’s not easy. The customer passes the information between agencies rather than the agencies, which use the same data, passing it to each other. I am pleased to say that our initial workshop was very encouraging - there is a clear will from all of the agencies involved to make things better. We reviewed the current journey and customer touchpoints and identified some quick improvements. These included our contact centres working together to share information so that we are not passing the customer between us while only providing answers to ‘our’ part of the process. We talked about the need to review all forms and leaflets so they provide a complete view of the process. We also discussed the need, identified by our customer insight, for information which provides the customer with a step-by-step process guide. All quick, but important changes. The later session focused on where our service design and technology is heading, and how we can make sure that our strategic direction is more collaborative when it comes to ‘tell us once’. DVLA technical architects explained the changes being introduced to our IT infrastructure as part of the vehicle excise duty (VED) reform project. This led to discussions about how we could share our learning across the various agencies to create a more joined-up approach to our data. Like a football fan looking forward to the World Cup, I am excited about the potential we have as a group to improve the service for the customer. So, next steps are to continue to work together, sharing information to create a customer-focused view of the end-to-end service and implement both short-term and longer-term changes, which will improve the customer experience. Colleagues from the Department for Transport (DfT), the Vehicle Certification Agency (VCA), the Driver and Vehicle Standards Agency (DVSA), Her Majesty’s Revenue and Customs (HMRC), and the Driver and Vehicle Licensing Agency (DVLA) attended a workshop to improve the vehicle first registration process.